When the Dodd-Frank Wall Street Reform and Consumer Protection Act (Dodd Frank) was passed back in July 2010, you could be forgiven for thinking that this was the regulation for global OTC swap reform. The US really were ‘first-to-market’ on this one, by a long margin, and we didn’t hear about OTC swap reform from other parts of the globe for the best part of another two years. Skip forward to August 2012 when the European Market Infrastructure Regulation (EMIR) was passed – the European equivalent of Dodd Frank’s Title VII – and the penny started to drop that this was unfolding to be a far bigger initiative than many folks had first thought. Now, if you had asked me earlier this year “was there life outside of Dodd Frank and EMIR”, I would have said yes and I could have told you that Canada and Australia had their own OTC swap reform programs, and that Hong Kong and Singapore were also looking to do something. It was only when I started digging deeper, that I realised how far off the mark I was. I mean, I only forgot Japan – the third biggest economy in the world – and I know they trade swaps out there for sure! To illustrate this, I dug out the latest FSB ‘Progress Report on the Implementation of OTC Derivatives Market Reforms’. 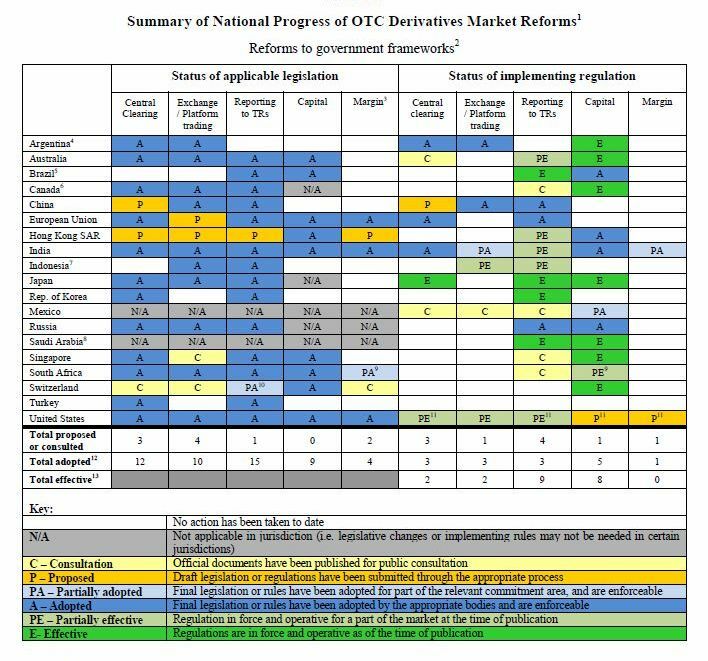 In all the excitement, I forget whether this is a quarterly or semi-annual publication 🙂 but on Page 9 is a table (see below) that highlights just how many countries are now involved in OTC swap reform programs. From a quick glance, you could argue that Mexico and Saudi Arabia need to ‘up their game’, but that would be missing the point. In a previous blog here on extraterritoriality, I looked at a scenario in which a London branch of a New York bank could be required to comply with two pieces of OTC swap reform regulation at the same time. In the same blog, I highlighted that the key solution to extraterritoriality and the cross-border application of OTC swap reform was equivalence, but there are some really big assumptions in all of that if you think that equivalence across 19 nations is just going to drop into place! In reality, the process is as daunting as swap reform itself. When you consider that the US and Europe are currently only looking at the largest of their fellow neighbours and that this ‘due diligence’ actually requires a regulation to be passed in itself, you get the scale of the task ahead. Further compounding this is that rather than being based on an ‘all-or-nothing’ model, substituted compliance works on a ‘rule-by-rule’ basis and so the number of permutations that are going to need facilitating, as the process tries to unfold, will be huge. The CFTC alone has already had to issue over 100 exemptions and no-action letters, some for an indefinite period of time, against the very rules that were just passed! And so as with most things to do with OTC swap reform, it’s the least obvious things that tend to cause the biggest headaches. This entry was posted in Capital Markets, Extraterritoriality, OTC Derivatives, Regulatory Change by John Philpott. Bookmark the permalink. Useful summary of the state of global OTC regulation, and long article covering the state of same by John Philpott.